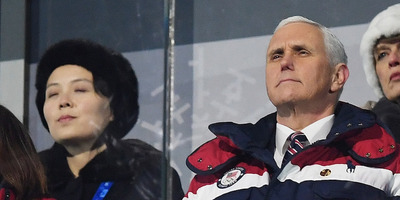 GettyMike Pence at the Pyeongchang Winter Olympics near Kim Jong Un’s sister Kim Yo Jong. US Vice President Mike Pence signalled a major shift in US policy on North Korea after leaving the Winter Olympics, saying the Trump administration was willing to talk to Kim Jong Un’s government without preconditions. North Korea earlier extended an invitation to South Korean President Moon Jae-in to be the first head of state to meet Kim Jong Un. North Korea put on a charm offensive at the Olympics, but some analysts say it has a weak position and may only be trying to buy time or put off an eventual war. US Vice President Mike Pence signalled a major shift in US policy on North Korea while returning home from the Pyeongchang Olympics, where he had an icy standoff with Kim Jong Un’s sister Kim Yo Jong. Speaking with The Washington Post’s Josh Rogin aboard Air Force Two on his flight home, Pence said the US was willing to participate in direct talks with North Korea’s leadership without preconditions – something experts have long urged the administration to do. The Trump administration’s “maximum pressure” strategy, whereby the US and its allies seek to exert economic, diplomatic, and military pressure on North Korea, had previously called for North Korea to begin denuclearizing before any official talks between the countries could occur. The major change in US policy comes amid a perceived North Korean charm offensive at South Korea’s Olympics. But beyond dispatching his younger sister, who heads up the country’s propaganda department, North Korean leader Kim Jong Un offered a material concession to South Korean President Moon Jae-in. In making the request, North Korea did not demand South Korea stop military exercises with the US, and it did not demand the withdrawal of US forces from the Korean Peninsula, but it also did not agree to stop its nuclear program. The Trump administration’s pressure campaign increasingly appears effective as fuel prices soar and businesses fold on both sides of North Korea’s border with China. “Kim Jong Un moved away from the original negative stance on the inter-Korean summit and change his stance of holding the summit without conditions,” Cheong said. Pence said that the adjusted US strategy involved following up inter-Korean talks with US-North Korea talks and that Moon pushed the North Koreans to talk to the US at the Olympics, according to The Post’s Rogin. Even though the sanctions on North Korea by the US and international community look to be bearing fruit, few experts project a good outcome. But as Moon sat next to Kim’s sister and watched the Olympic skaters, protesters outside burned North Korean flags. North Korea’s olive branch comes amid news that the US is considering a military strike on Kim’s forces and amid increased scrutiny by President Donald Trump of the country’s human-rights record. Because of North Korea’s perceived weakness, one could doubt the sincerity of the talks, but the US’s recent record isn’t so great either. Secretary of State Rex Tillerson said months ago that the US would talk to North Korea only to have the White House contradict him later. Though Pence told The Post he and Trump had talked every day during his trip and were on the same page, a tweet from the president could reverse everything. Whether North Korea’s leadership sincerely wants to thaw relations with the South or whether it merely wants to buy time and delay any further escalation from the US remains to be seen.